I ordered 4 black counter height chairs and I love the way they look. Add stunning vintage inspired seating to your counter height table or bar with the Eleanor Counter Height Swivel Chairs by iNSPIRE Q Classic. The graceful French ladder back adds a sense of charm to this design while the linen upholstered seat cushion adds comfort. The swivel feature is perfect for casual dining and ease of conversation. 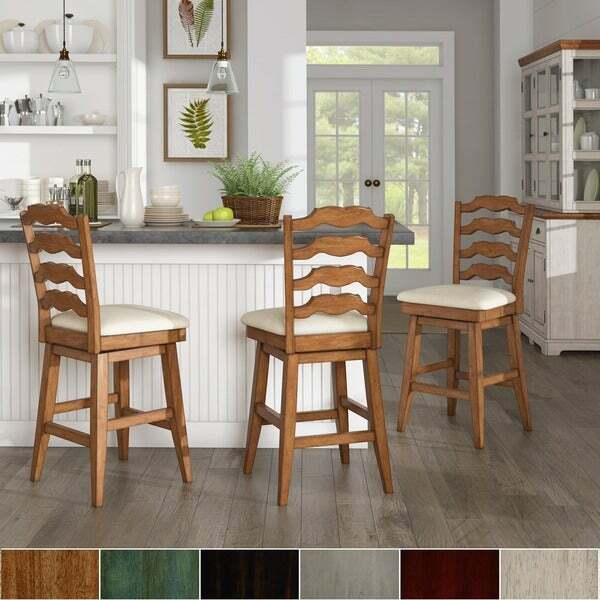 This stool is available in several distressed finishes, including neutrals and bright hues, so you can express your unique design taste. At iNSPIRE Q, our designer-curated lifestyles reflect current trends and timeless essentials, giving you the know-how to achieve your vision. With diverse style inspirations to choose from, you'll be able to find the one that speaks to you - or mix and match across collections for a style that's all your own. Whether you're cool and contemporary, retro, free-spirited, vintage, or classic, iNSPIRE Q is here to help you achieve the home of your dreams, every step of the way. Click here to explore the six style inspirations: iQ Bold, iQ Modern, iQ Classic, iQ Artisan, iQ Junior, and iQ Oasis. They are beautiful barstools but beware they are not the measurements as advertised. The seat height is only 24 inches high. We ordered these since the description and diagram state the seat height is 25.8 inches and they are clearly not this height. Hopefully they correct this error on the website, I did call and notify them of the error. Very disappointed since we ordered these to get a taller stool. I ordered thes swivel counter height chairs in antique white. These chairs are so comfortable. The asssembly was easy, I was able tocomplete on my own. These counter stools are beautiful! 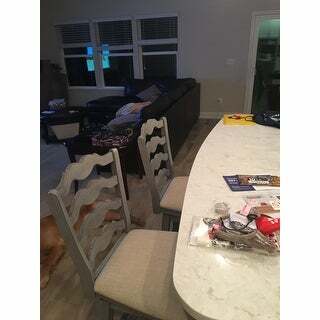 I have been looking at stools for our new kitchen for months and finally decided on to perchased.These stools look fantastic at my counter height island. They are heavy, very sturdy and comfortable! I was worried about how comfortable .They were well packaged and arrived in excellent condition. I had previous 1 year old stools. with my bad hip I needed a larger seat on my stool. this one worked great and with the swivel is easier to get on and off the stool. 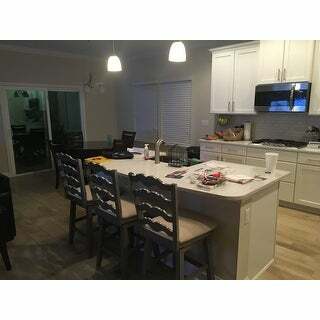 It actually match out kitchen better than the first set. I like the quality of these chairs. My husband assembled these, but on one chair some of the hardware was missing. Luckily he was able to complete the assembly with the hardware he had at home. really like the chairs. after putting the first one together the rest were pretty simple. First one took a little less than an hour. seems to be well made. one seat cushion appears a little loose but not a problem. over all happy with the chairs. I love these stools, they fit perfectly into my space. They have an antique look to them and yet they are totally modern and comfortable. They swivel around nicely! These stools are beautiful. They were easy to put together. We have the red color and it is deep and rich--almost a merlot color. The stools are solid and the seat covering is a very high quality fabric. Great purchase. If you are not afraid of some assembly, then these are very good. They look fantastic. We’ve had these chairs for six months now and they do not seem to be made fir everyday use. We have to tighten the screws at least once a month and they are only six months old. While they look pretty they are not practical for everyday use. Chairs look great. First one took a while to put together but the next two went pretty quickly. They seem really sturdy and exactly what was pictured. End results were good but little bit difficult to install. Overall the chairs are true to color and the online discription was very clear. The chair came promptly and in great condition. It was just what I wanted. Putting it together was fairly simple and the chair is very attractive and well-built. Would highly recommend it! "Does this stool have a memory swivel?" Hello, this stool does not have memory swivel. "Will you be getting the antique gray back in stock?" "What exactly is the seat height. According to one of the reviews, it's closer to 21 inches than 25.8 as the specs indicate. Please clarify!" "What is the exact height of the seat?" Dimensions are: Seat dimensions: 18.7 inches wide x 21.7 inches deep x 25.8 inches high. Overall: 18.7 inches wide x 21.7 inches deep x 41.2 inches high. The seat is approximately 25.8 inches high. To match my New Kitchen in my New Home! We choose this product because the antique grey finish matches our countertop. "What is the weight capacity for these chairs?" These have been weight tested up to 250 pounds.